This beautiful cobalt wedding ring is bright white and features a 10mm width with a stepped edge. The contrast is incredible against the black polish. 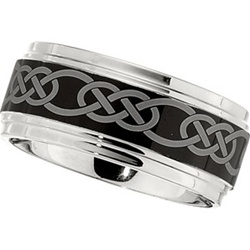 The detail in the Celtic knot is fantastic and the overall finished product is sure to be the perfect men's wedding band. Look at the narrower versions and match up a great couples wedding band set. This product is stocked from sizes 8-14 including half sizes, and must be returned within one week of order for replacement or size exchange. Ships within 24 hours.